On TV – To be honest – I have some catching up to do this weekend on my DVR from this week! But I did watch the finale of The Bachelorette it was Jef with one F over race car driving Arie. Live! with Kelly – Tuesday was the last day I ran home to watch my DVR (see last week’s Friday Favorites for the details) My childhood friend Michael Buckley, @buckhollywood, co – hosted Live! with Kelly for the whole hour. He did an amazing job! Highlights for me – asking Emily (of Emily and Jef with one F) what her strategy was to make this engagement work (ha ha – loved it!) eating crazy, mysterious foods with a smile, and seeing his whole family in the audience! As the Governor of CT tweeted him, #CTGrown. TEACHABLE MOMENTS – Letter to Parents – as a former teacher I understand and appreciate this! I tip my hat to the countless individuals who go into the classroom each year – you are inspirational! MARTHA STEWART LIVING – Zucchini and Squash Recipes – tips on what to look for, how to store, plus delicious recipes. Salad Bar Savvy by Weight Watchers – how to build a better salad cheat sheet! How to Test Cookies for Doneness by Better Homes & Gardens – I don’t know about you, but I have burned my fair share of cookies! This will help you make sure you cook different type of cookies for exactly the right amount of time. 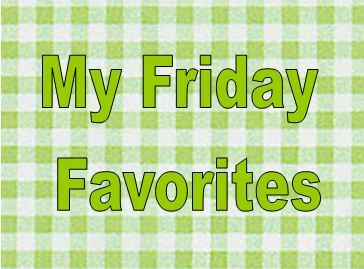 I would love to hear about your favorite things this week. Leave me a comment and tell me about them! As always, thank you for stopping by and reading. Have a great weekend!